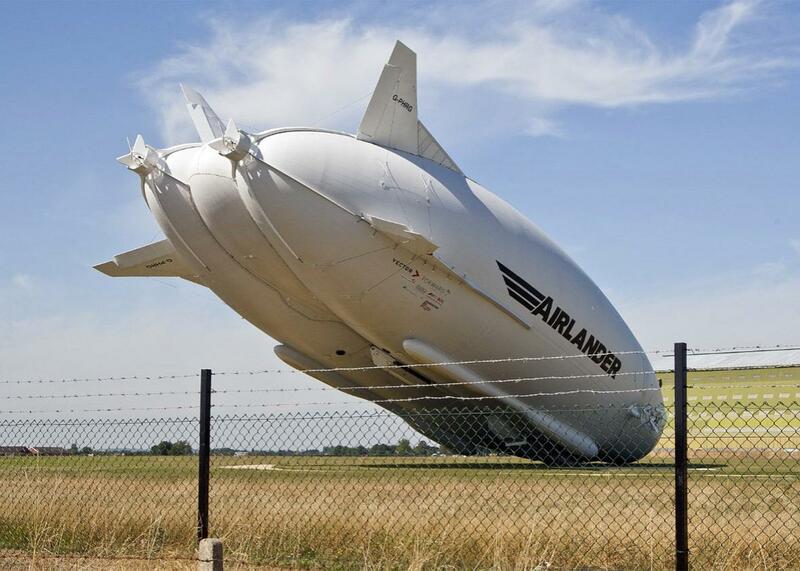 Airlander 10 airship, aka "the flying bum,” makes slowest crash landing ever. The world’s largest airship, nicknamed the “flying bum,” crash-landed in a field in England on Wednesday. The world’s largest aircraft may have set a second, less-dignified record on Wednesday, when it executed what was quite possibly the world’s slowest crash landing. The 302-foot-long Airlander 10 airship, aka the “flying bum,” head-butted the ground Wednesday morning in an airfield in Bedfordshire, England. The airship’s crew were reportedly alive and well following the mishap, though the $33 million craft sustained damage to its cockpit. Nose-diving into the ground on just its second flight might seem an ignominious setback for a vessel intended to resuscitate the long-dormant airship industry. But a spokesman for the Airlander’s owner, a British firm called Hybrid Air Vehicles, put a charmingly positive spin on it. “The flight went really well and the only issue was when it landed,” he told the BBC. Originally developed by the U.S. Department of Defense as a military surveillance craft, the Airlander was jettisoned in the 2013 budget sequestration, in what now appears to have been a blessing in disguise. But Hybrid Air Vehicles, better known as HAV, purchased it and reconfigured it for the commercial market with the help of a $5 million British government grant. Its commercial applications are still to be determined, although HAV believes it holds potential for tourism, cargo missions, and data-gathering. The Airlander was featured in a February New Yorker story about a resurgence of interest in airships, which fell out of favor after one called the Hindenburg exploded over New Jersey in 1937, killing 36 people. In March, Lockheed Martin inked a $480 million agreement to build 12 of its LMH1 airship, which is designed to carry 20 tons of cargo to remote areas. A California-based firm called Worldwide Aeros Corp. pivoted from advertising blimps to surveillance blimps after Sept. 11, 2001, and it’s now building its own rigid airship, the Aeroscraft ML866, which at over 550 feet in length would dwarf even the Airlander. The Airlander is what’s called a “hybrid airship,” a type of dirigible that obtains lift via a helium-filled hull, but has a rigid frame that gives it some characteristics of more conventional aircraft. The company says it’s designed to stay aloft for up to five days and use far less energy than other forms of air transport. It can carry more than 22,000 pounds of cargo at up to 90 mph, with a maximum altitude of 16,000 feet. The blooper comes less than a year after a U.S. Army blimp broke free from its tethers in Maryland and drifted languidly into Pennsylvania, trailing a 6,700-foot mooring cable that sliced through power lines as F-16 fighter jets trailed helplessly alongside. State troopers eventually shot the blimp down, and Congress cut the project’s funding this year.